Despite having two degrees in mechanical engineering, a passion for thermodynamics, and a love for math, PhD candidate Jaichander Swaminathan spends most of his time these days fixing leaks. An MIT Tata Center fellow and Deshpande Center grantee, Swaminathan is developing a modular desalination system for small textile dyeing mills in India that are struggling to comply with India’s zero-liquid discharge regulations, which have already forced some mills to close their doors. Zero-liquid discharge is the idea that, instead of being discharged back into a body of water, such as the Ganges River, potentially contaminated water can be cleaned up and reused. Textile mills in India use water and salts in their dyeing process, and the byproduct is both contaminated and salty. Swaminathan, who grew up in Chennai, India, has been investigating ways to desalinate extremely high-salinity water in an energy-efficient way, and has found a great match in this application. Having earned his undergraduate mechanical engineering degree from Indian Institute of Technology in Madras and his master’s degree in mechanical engineering at MIT, Swaminathan has always loved math. 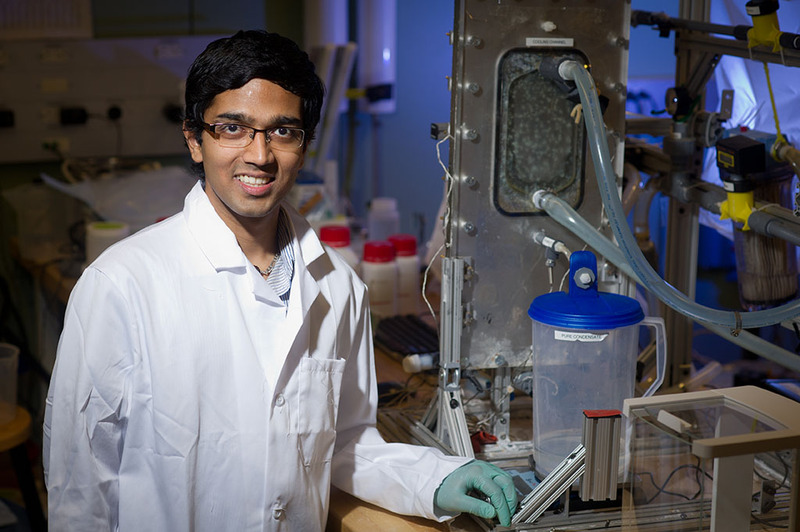 As a PhD student under Professor Lienhard, Swaminathan is interested in applying his math skills to the problems of energy efficiency with membrane distillation, which utilizes heat to distill salty water. For his PhD thesis, he is developing a cheaper, miniature version of a very large desalination system that uses a vacuum to move water through multiple boiling chambers, a system known as multi-effect distillation. Swaminathan’s mini version will provide smaller enterprises, such as a dyeing mill, with an affordable, on-site method of desalination and zero-liquid discharge. It also reduces the overall power consumption that normally goes hand in hand with the full-scale version, opening up the possibility of utilizing solar or geothermal power instead of electricity. There are only two problems with the mini version. One is membrane fouling, which Swaminathan spent most of his time as a master’s student researching, and the other is energy efficiency. Because it’s smaller and made of plastic instead of steel, it’s affordable to purchase and operate, but unfortunately, in its current iteration, it’s also less energy efficient. But even during his master’s degree research on membrane fouling, Swaminathan had his eye on solving the energy efficiency problem. “My idea is to replace the air gap, which is usually present between the membrane and the condensing surface to prevent heat loss, with a more conductive gap to increase efficiency. Swaminathan produced a numerical model to show that his idea could work, then conducted several experiments to prove its viability. The system he’s developing can take advantage of the small-scale benefits, but it can also be scaled up quite easily, simply by repeating the same configuration multiple times. One configuration of his system can produce two to four liters of desalinated water per square meter per hour. Now that Swaminathan has shown the viability of his idea, he’s started working on new designs, such as spiral membranes, that will help to reduce heat loss even further. In the end, when the leaks are fixed and the energy efficiency is fully optimized, Swaminathan’s work will save water, money, and energy, and could enable dyeing mills in India to stay in business.